There is little doubt that Aaron Sorkin is among the best screenwriters. But he’s never directed a movie. Until now. Sorkin makes his directorial debut with MOLLY’S GAME. And it mostly works. 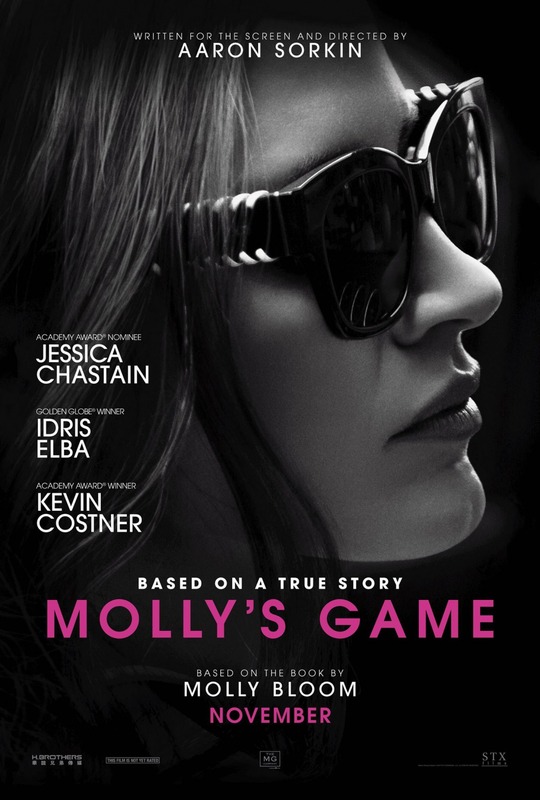 Jessica Chastain is Molly Bloom, a former champion moguls skier who is forced to retired after injury. Her plan is to go to law school. She moves to Los Angeles and in need of a job hooks up with a connected guy who runs a back room poker game. She realizes she has an affinity for running the games and a natural camaraderie with the players. She eventually moves on and runs her own high stakes game. Molly is too trusting and that causes her to lose the L.A. game and she moves to New York where she starts over. There are much shadier characters involved and eventually she starts skimming money for herself. That’s where she bumps up agains federal law. Who knew it was legal to run a poker game as long as you didn’t take a piece of the pot. That’s where she got in trouble with the feds. But this isn’t only about the poker games. In flashbacks we see she was always a rebellious child, testing her demanding father (Kevin Costner) and growing to hate him for pushing her. Side note, her brother is Jeremy Bloom, former Olympic champion who also had a short NFL with the Eagles and Steelers. Molly is kind of out on an island by herself. She has no “muscle” to collect on outstanding debts. The stress has forced her to start taking drugs. It all is going quite sideways when the Feds finally arrest her. Chastain is fabulous. It’s a great part for her and she is a natural for Sorkin’s rapid fire dialogue. She has to carry the movie and it rests easy on her shoulders. Idris Elba plays her lawyer. Man, he is just a great actor. In everything. Even bad movies, he’s the shining light. The Sorkin banter between him and Chastain feels organic, even if the style can seem a bit stilted. MIchael Cera also has a great small role as an anonymous Hollywood actor who plays in Chastain’s game. He’s got a darkness in this role that I don’t know that I’ve ever seen from him. The script is fabulous. I am biased. I love everything Sorkin writes. I’m envious, jealous and in awe all at the same time. But his directing… well, let’s just say that is a work in progress. His sometimes word heavy dialogue needs some kind of balance from the director. But you don’t get that here. It’s most annoying in the opening scenes of the movie where Chastain is skiing and explaining everything and well, I didn’t get lost but it was a lot of sensory input. When he doesn’t attempt to imprint a style on the direction is when it works best. The movie is also a little long.. could have lost about 20 minutes. Some may not like the emotional payoff between Molly and her father, but it worked for me. I got choked up. Maybe I”m getting soft. Sorkin’s writing is a sure thing. The directing right now feels a little like he’s bluffing with a pair of 3’s. But sometimes the guy with the worst cards wins the pot. And in this case, MOLLY’S GAME is a safe bet. It is hard not to like THE POST. Spielberg, Hanks, Streep. Its success and quality are pretty much a guarantee. But the question, “does it work?” has been nagging at me for about three weeks. The answer is not cut and dried. The publicity sells the movie as the story of the Washington Post’s publication of the Pentagon Papers and a flag waver for journalism. That’s part of it. The other part is the story of Katharine Graham, the late publisher of the Post. Graham inherited the paper from her father, Eugene Meyer. When he stepped down he appointed Katharine’s husband, Phillip Graham as publisher. But in 1963, Graham committed suicide. That left Katharine in charge. She was a Washington, D.C. socialite and while she ran the paper, the movie portrays her as an unsure figurehead who relied heavily on the board of directors for guidance. At the time of the Pentagon Papers, The Post was preparing to go public for the first time. Any controversy could scare off the banks backing the offering. In the middle of this corporate drama, the New York Times publishes the Pentagon Papers. This was a classified analysis ordered by Lyndon Johnson’s Secretary of Defense Robert McNamara evaluating the U.S. role in Vietnam. Basically, it detailed deception and lying on the part of Presidents going back to Harry Truman about what was really going on in Southeast Asia. And it was buried. But Daniel Ellsberg in a fit of conscience, and some might say patriotism, leaked the contents. The Washington Post’s irascible editor Ben Bradlee did not like getting beat by the Times, but when a court order prevented the Times from publishing any more of the Papers, they were leaked to the Post. That long explanation sets up the dramatic tension in the film. Should Graham publish and risk the public offering which will help the financially strapped paper or should she play it conservatively? It’s no spoiler to say The Post published. The “how the sausage is made” part of the movie is ok, but kinda falls a bit flat when compared with movies like SPOTLIGHT or ALL THE PRESIDENT’S MEN. Those make the process more dramatic. And because that’s not the total focus of the film it doesn’t get enough time to breathe. The part that totally worked for me was Katharine Graham’s story. Her evolution as a leader and a woman in power sent a sublime message, especially in these times where women’s treatment in the workplace is the focus of so many ugly stories. Graham was friends with Robert McNamara, so the dynamic was not just about the Post, but about her breaking free of her circle of privilege. That, plus the overarching message about the necessity of press freedom in the era of Trump made the movie work. There are great performances all over. Meryl Streep is Meryl Streep. She hits the right notes without making Graham seem too “pearl clutching” or too badass. Bruce Greenwood is fantastic as McNamara. He’s got him nailed. It was a great, yet important small role. 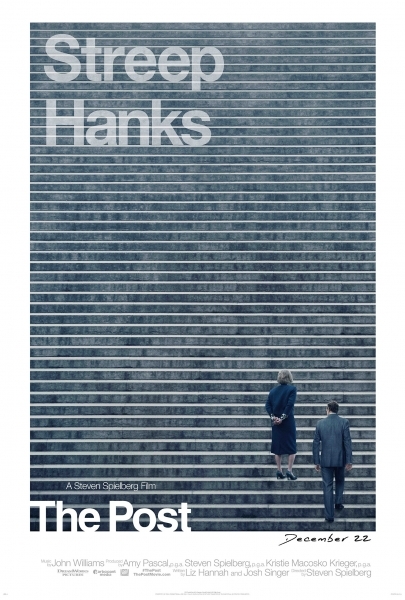 Tom Hanks was very good as Bradlee. But it took me a while to come around to that conclusion. First, I cannot think of Bradlee without thinking of Jason Robards’ Oscar winning performance in ALL THE PRESIDENT’S MEN. So, it took me a while to forget I was watching Hanks and get into his performance. But like Streep, he is fabulous in just about everything he does. In the end, I enjoyed the movie very much. 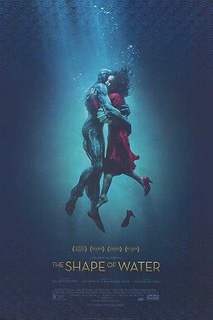 It fell flat on a couple of counts for me so I can’t say it was one of the best movies I’ve seen all year. Steven Spielberg put another project on hold to rush THE POST out this year. He thought it was that vital for people to know the story. Maybe if the movie was allowed to bake for another few months, some of the problems could have been ironed out. But given the current political climate it is immensely important.